Provided further that where the supplier of service is a banking company or a financial institution including a non-banking financial company, the period within which the invoice is to be issued shall be forty five days from the date of supply of service. 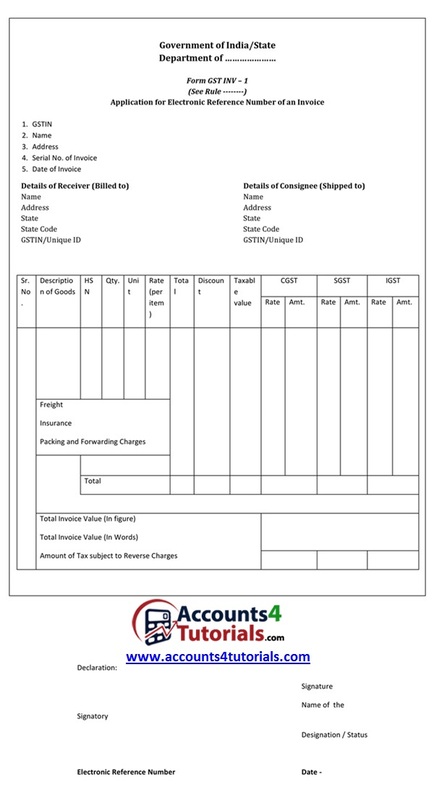 Provided that the duplicate copy is not required to be carried by the transporter if the supplier has obtained an Invoice Reference Number under sub-rule (4). INV-1, and produce the same for verification by the proper officer as required under section 61 in lieu of the tax invoice. (5) The Invoice Reference Number shall be valid for a period of 30 days from the date of uploading. Provided also that a consolidated bill of supply shall be prepared by the registered taxable person at the close of each day in respect of all such supplies where the bill of supply has not been issued in terms of the second proviso. Provided further that in case of inter-State supplies, where the value of a supply does not exceed two hundred and fifty thousand rupees, a consolidated revised invoice may be issued separately in respect of all recipients located in a State, who are not registered under the Act. Provided that where the Input Service Distributor is an office of a banking company or a financial institution including a non-banking financial company, a tax invoice shall include any document in lieu thereof, by whatever name called, whether or not serially numbered but containing the information as prescribed above. (2) Where the supplier of taxable service is a banking company or a financial institution including a non-banking financial company, the said supplier shall issue a tax invoice or any other document in lieu thereof, by whatever name called, whether or not serially numbered, and whether or not containing the address of the recipient of taxable service but containing other information as prescribed under rule 1. (3) Where the supplier of taxable service is a goods transport agency supplying services in relation to transportation of goods by road in a goods carriage, the said supplier shall issue a tax invoice or any other document in lieu thereof, by whatever name called, containing the gross weight of the consignment, name of the consignor and the consignee, registration number of goods carriage in which the goods are transported, details of goods transported, details of place of origin and destination, GSTIN of the person liable for paying tax whether as consignor, consignee or goods transport agency, and also contains other information as prescribed under rule 1. (4) Where the supplier of taxable service is supplying passenger transportation service, a tax invoice shall include ticket in any form, by whatever name called, and whether or not containing the address of the recipient of service but containing other information as prescribed under rule 1.